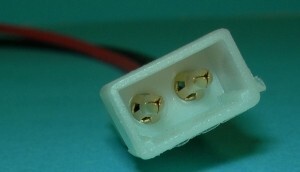 Connector for use on ignition engines (3W). 9 inch pigtails, 18 gauge wire. Tight fitting, vibration resistant polarized plugs. One male, one female per set. 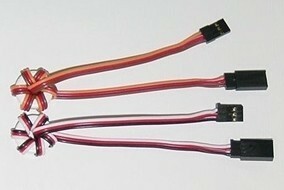 6 inche extension includes ferrite toroid. Perfect between RX and throttle servo which is mounted up front near spark ignition system. Greatly reduces RF interference from ignition system that would otherwise wick down servo wire into your RX. Also useful for battery packs or any other items located close to ignition or any other source of unwanted RF. 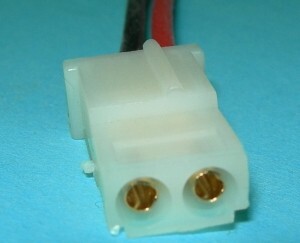 Connector for use on ignition engines (3W). 9 inch pigtails, 18 gauge wire. Tight fitting, vibration resistant polarized plugs. 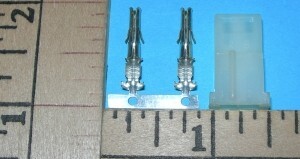 This listing is for one male connector only. Photo is for display only. 9 inch pigtail, 18 gauge wire. Tight fitting, vibration resistant polarized plugs. This listing is for one female connector only. Photo is for display only. Replace damaged connectors or make your own custom AMP wiring. Enough parts to build one AMP Male connector. Replace damaged connectors or make your own custom AMP wiring. Enough parts to build one AMP Female connector. 6 inch extension includes ferrite toroid. Perfect between RX and throttle servo which is mounted up front near spark ignition system. Greatly reduces RF interference from ignition system that would otherwise wick down servo wire into your RX. Also useful for battery packs or any other items located close to ignition or any other source of unwanted RF.